The most important time in a Samburu Males life is the rite of passage from circumcision to becoming a Warrior. It is easily the most intense and definitive moment in their lives. After the circumcision ceremony, which occurs once every 15 years (and lasts through a ritual period culminating in a 5 day event) the young men are sent off to live in the bush for 40 days known as "Time Time of the Birds". During this phase, they hunt small birds with a traditional bow and arrow in order to create a crown of feathers - after this 40 day stage of initiation they gain the capacity of strength and focus for their new role in life, which is to protect the tribe and their livestock (as well as being fully capable of hunting and killing a Lion with a spear or knife should that be required of them). 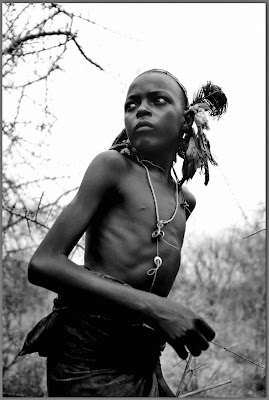 Being a Warrior is the most important part of their lives as a Samburu tribesman. These images were shot while following a young group of conscripts in their last days of living in the wild before going through the final ceremony with their fathers of becoming a Warrior.